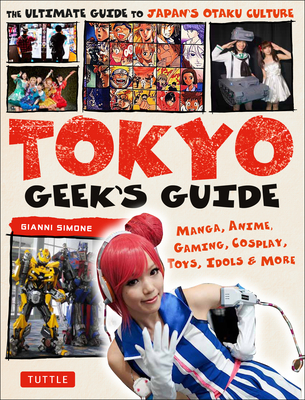 Tokyo is ground zero for Japan's famous "geek" or otaku culture--a phenomenon that has now swept across the globe. This is the most comprehensive Japan travel guide ever produced which features Tokyo's geeky underworld. It provides a comprehensive run-down of each major Tokyo district where geeks congregate, shop, play and hang out--from hi-tech Akihabara and trendy Harajuku to newer and lesser-known haunts like chic Shimo-Kita and working-class Ikebukuro. Dozens of iconic shops, restaurants, cafes and clubs in each area are described in loving detail with precise directions to get to each location. Maps, URLs, opening hours and over 400 fascinating color photographs bring you around Tokyo on an unforgettable trip to the centers of Japanese manga, anime and geek culture. Interviews with local otaku experts and people on the street let you see the world from their perspective and provide insights into Tokyo and Japanese culture, which will only continue to spread around the globe. Japanese pop culture, in its myriad forms, is more widespread today than ever before--with J-Pop artists playing through speakers everywhere, Japanese manga filling every bookstore; anime cartoons on TV; and toys and video games, like Pokemon Go, played by tens of millions of people. Swarms of visitors come to Tokyo each year on a personal quest to soak in all the otaku-related sights and enjoy Japanese manga, anime, gaming and idol culture at its very source. This is the go-to resource for those planning a trip, or simply dreaming of visiting one day. Gianni Simone is the Japan correspondent for Vogue Italia and a regular contributor to The Japan Times. His writings have also appeared on Flash Art and CNN Travel websites and in Zoom Japon and San Francisco Arts Quarterly magazines. Simone has lived in Japan for almost 25 years, and he resides in Yokohama with his wife and two sons.